If you've ever visited Tokyo Disneyland, then you might know what I mean when I say that sometimes Japanese people like to dress all matchy-matchy. And when I say matchy-matchy, I mean head-to-toe dressed in the same outfit like some kind of throwback to the 1990s when Mary-Kate and Ashley were still a thing. Same shirt, same skirt, same shoes, and even the same hair accessories. In America, we don't do this sort of thing very often. The only time I can think of is possibly at Halloween or maybe if you get roped into wearing some sort of "Johnson Family Reunion" t-shirt for a family gathering. It's kind of like that scene in Mark Waters' movie, Freaky Friday, when the teenage Anna goes to high school one morning and sees another girl wearing the same shirt as her; Anna immediately runs to the bathroom and turns her shirt inside out so that it would look different and so that nobody would realize it was the same. As Americans, we like to be seen as individuals. We like to be unique. So we don't necessarily want to be seen wearing the exact same outfit as somebody else. 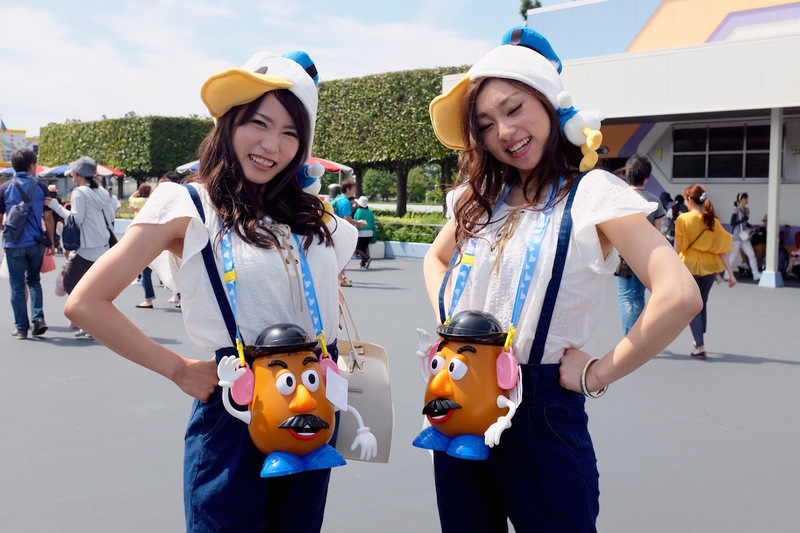 In Japan, however, wearing exactly the same outfit as your best friend is seen as not only fun, but as fashionable. Wearing matching outfits is known in Japanese as Osoroi Code (お揃いコーデ) and the name itself is a shortened version of the English word, "Coordinate." お揃い means, "Same, matching, or going together," so in essence the phrase can be directly translated into something like, "Matching Coordination" in English. It's extremely popular among young people, especially girls. But the question remains as to why. Why would dressing up in matching outfits be so alluring to the Japanese? A lot of it has to do with how vital relationships are to the Japanese culture. A person often will define their identity based upon the relationships that they have and who they associate as their "in group." In the book The Japanese Mind, by Roger J. Davies and Osamu Ikeno (a completely fascinating read, by the way), this idea is expanded upon more fully: "In Japanese society, people are primarily group-oriented and give more priority to group harmony than to individuals. Most Japanese consider it an important virtue to adhere to the values of the groups to which they belong. This loyalty to the group produces a feeling of solidarity, and the underlying concept of group consciousness is seen in diverse aspects of Japanese life." As such, osoroi code can be seen as a way to physically express "this feeling of solidarity" or the closeness of the bonds shared by the members of a certain social group. Friends, families, or couples will use osoroi code as a way to show their affection toward one another. The practice makes those involved feel more connected and strengthens their relationship. Besides that, just think of how much cuter you and your squad will look in your Instagram selfies when you are all matching. #squadgoals, am I right? And we all know how important kawaii culture is in Japan. Where and When Should I do it? From my observations, osoroi code isn't something that you do on a daily or even a regular basis - it's usually reserved for special outings or day-trips. The most common place you will see osoroi code in action is (as I mentioned above) at Disneyland or DisneySea. I asked a Japanese acquaintance of mine about this once, about why all the young women at Disneyland liked to dress matchy-matchy with their friends. Her answer was that it’s just something that you do when you go to Disney. She explained that half the fun of the trip was planning what she and her friends were going to wear together. So, if you are planning a trip to Tokyo Disneyland, don’t be afraid to pull out those matching Christmas sweaters that your parents bought you a few years ago – the ones you vowed never to wear again – and take to the streets. It might be a bit embarrassing, but I assure you, there will be plenty of other people doing the same thing.